While fancy youtube videos and twitter-based cheer-leading continues to be the weapon of choice against the post-Shuttle era depression, one vehicle is quietly going about its business with tangible results, as opposed to backslapping tweets. 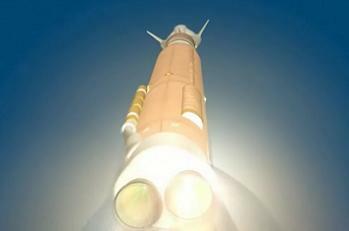 The Atlas V launch vehicle – about to launch a mission to Mars – is on a winning streak, which includes strides towards its future crewed ambitions. With rollout complete for Saturday’s launch of Mars Science Laboratory (MSL) from Cape Canaveral, the United Launch Alliance (ULA) vehicle is aiming for its 28th success in a row, a 100 percent record since its maiden launch in 2002. The Atlas V is a flight-proven expendable launch vehicle and is currently used by NASA and the Department of Defense (DOD) for critical space missions to launch highly expensive payloads into orbit. 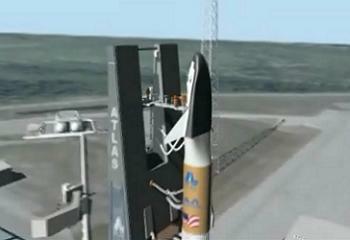 Now, Atlas V is walking down the path of proving it can be entrusted with launching humans into orbit. The MSL launch will be the second flagship mission of the year, following the successful launch of NASA’s Juno probe, which is currently on its way to Jupiter. With numerous spacecraft successfully lofted uphill, Atlas V’s reliability continues to be an attractive proposition in the launch services industry, despite the continued rise of Arianespace’s industry-leading Ariane 5, and the new kids on the block, such as SpaceX’s Falcon 9 range. However, the major challenge – one which reaches back into the heritage of the Atlas launch vehicle family – is yet to come, centered around NASA’s Commercial Crew Development (CCDev-2) contracts. Ridiculed by previous NASA evaluations during the a period of what sources claim was “protection” for the now-defunct Ares I, Atlas V was shunned from crewed mission viability via the notion of “black zones” – a claim that the vehicle’s trajectory was unable to safely abort a crewed mission in the event of a serious failure. It was documented that NASA considered – and rejected – the use of Atlas V as a Space Shuttle replacement for human space flight during their Exploration Systems Architecture Study (ESAS) in 2005. However, this was mainly based on the heavy Orion crew vehicle of the time. Just one year later, in 2006, Lockheed Martin noted that for a 20mt crew vehicle, there was enough margin in the Atlas V 401′s flight envelope to allow the crew to safely abort at any time during launch, closing all unsafe ‘black-zones’. Also, for such a mass requirement, structural loads on the vehicle would be decreased to the point all primary structures meet NASA 1.4 Factor of Safety margins. Analysis also showed the Russian-built RD-180 engine in this regime revealed only one component that “fell a hair below” the 1.4 margin, at a 1.38 Factor of Safety. This led to the 2006/2007 agreements with Bigelow Aerospace for crew transportation requirements to the planned commercial space hotel complex. Little more was heard for a few years, as Atlas V continued to loft payload after payload successfully into orbit, that was until the Commercial Crew drive by NASA, as the Agency scrambled to close the gap between the retirement of the Shuttle’s NASA role and the handover of Low Earth Orbit (LEO) to commercial companies. 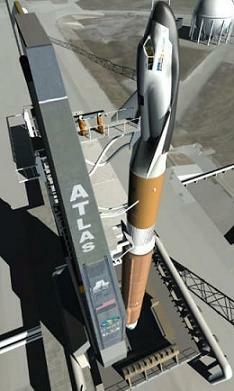 The breakthrough for Atlas V came in July of this year, as ULA signed an agreement with NASA for an unfunded Space Act Agreement (SAA) to work on human rating the launch vehicle, with the goal of certifying Atlas V to launch NASA astronauts riding in vehicles such as the Dream Chaser, Boeing CST-100 and Blue Origin’s spacecraft. The process – which includes NASA managers providing oversight into the evaluations – is proceeding to plan, as ULA successfully completed the second required major performance milestone, known as the Design Equivalency Review (DER), which completes a rigorous assessment of the flight-proven Atlas V launch vehicle’s compliance with NASA human spaceflight requirements. With a hat-tip to how Atlas V is already entrusted with the safe flight of billion dollar spacecraft, the need for any lengthy and inherently risky launch vehicle development program is expected to be avoided. “The Design Equivalency Review allowed the NASA team to compare their stringent human spaceflight requirements against the Atlas V design and demonstrated performance,” noted George Sowers, vice president of business development and advanced programs. “The ULA team benefited greatly from NASA’s insight and expertise. The completion of the DER is one more step towards confirming that Atlas V is the best choice for providing near-term, safe and affordable launch services for NASA human spaceflight. ULA – announcing the news this week – also noted that as NASA moves forward into the first phase of the Commercial Crew Integrated Design Contract (CCIDC), ULA are confident they will be the launch provider of choice to offer human-certified Atlas launch services to meet the needs for the crew transportation system providers. “The CCIDC is the critical first step towards creating a robust commercial crew transportation capability to low-Earth orbit (LEO). ULA looks forward to continued work with our customers and NASA to develop a U.S. crew space transportation capability providing safe, reliable and cost-effective access to LEO and the International Space Station.” added Dr Sowers. Other milestones in work include the Development of Hazard Analyses unique for human spaceflight, the Development of a Probabilistic Risk Assessment (PRA), the Documenting of Atlas V CTS (Crew Transportation System) certification baseline, and to Conduct Systems Requirements Review (SRR). The majority of this process is expected to be completed by the end of this year (2011), with the SAA allowing ULA to work with NASA to gain invaluable insight into their unparalleled expertise in Human Spaceflight. Through this SAA, NASA’s Commercial Crew Program and ULA will establish an Atlas V system baseline compliance with NASA CTS requirements and processes. A large part of the effort is focused on the continued development of an Emergency Detection System prototype test bed. The EDS will monitor critical launch vehicle and spacecraft systems and issue status, warning and abort commands to crew during their mission to low Earth orbit. While Atlas V makes progress towards becoming a Commercial Crew provider, the transports which have already opted to fly with the ULA vehicle are also pushing forward with their CCDev-2 goals – with varying levels of success. Boeing and their CST-100 spacecraft – recently signed a 15 year lease to utilize Orbiter Processing Facility (OPF-3) at the Kennedy Space Center (KSC). The deal was announced following a NASA agreement with Space Florida – the States aerospace economic development agency. 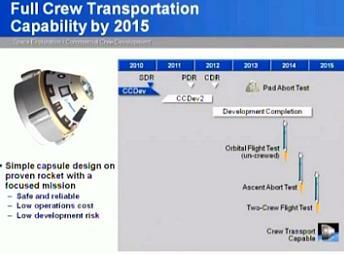 Boeing are currently working through their CCDev-2 contract milestones – worth over $92m – which is centered around their CST-100 capsule, a vehicle which is configurable to carry up to seven crew/passengers or an equivalent combination of passengers and pressurized cargo to LEO destinations, including the ISS and the BA-330 space complex. 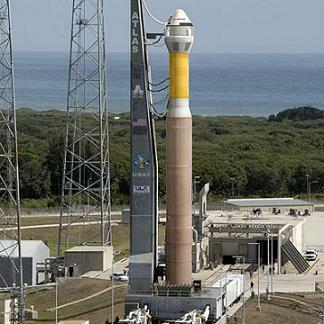 While their CST-100 capsule is compatible with multiple launch vehicles, the Atlas V was confirmed as the initial LV of choice, following their August, 2011 deal. According to an expansive CCDev-2 presentation – acquired by L2 – development kicked off with a Delta Systems Definition Review, followed by a Phase 0 Safety review, both of which were completed in May. 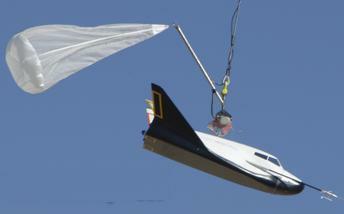 A Landing Air Bag drop demo was completed in August, followed by Phase 1 Wind Tunnel Tests. October was on the schedule for the Interim Design Review (IDR) take place – although its completion is yet to be confirmed – with a Parachute Drop Test demo on the books for next April, part of a total of 25 CCDev2 milestones. Boeing plans to use wind tunnel testing of the Atlas V and the CST-100 this year to complete a Preliminary Design Review (PDR) of the integrated system in 2012 under the second round of its Commercial Crew Development Space Act Agreement with NASA. Boeing claim they will be ready to provide services by 2015, a target date which is being used by most of the CCDev-2 award winners, as much as recent concerns over NASA funding is threatening slips in the schedule by one to two years. Blue Origin’s $22m award was for their their biconic-shape capsule, which will initially launch with the Atlas V launch vehicle, prior to hitching a lift uphill via its own Reusable Booster System (RBS). The Blue Origin vehicle has mostly shunned the public limelight, although the aforementioned CCDev-2 presentation provided some details on the key development milestones. “During CCDev-2, Blue Origin with mature their Space Vehicle design through System Requirements Review (SRR), mature the Pusher Escape System, and accelerate engine development for the Reusable Booster System (RBS),” noted the presentation. While all of the aforementioned events have received their “kick off” meetings, the listed milestones include the Space Vehicle Mission Concept Review in September, ahead of key Pusher Escape Test Vehicle shipment and ground firing either side of the new year. A Pusher Escape Pad Escape Test is scheduled for April, 2012, followed by the SRR in May – the month which will result in the opening RBS Engine Thrust Chamber Assembly (TCA) test. 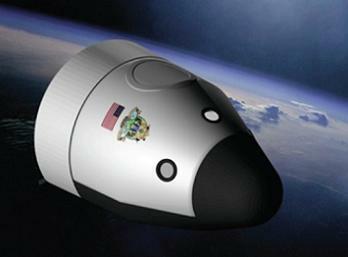 Sierra Nevada Corporation (SNC) and their Dream Chaser (DC) Space System (DCSS) provides the poster child of the Atlas V options, given it is the only “space plane” option, as seen via its “baby orbiter” appearance. Dream Chaser is a Reusable, Piloted Lifting Body, Derived from NASA HL­‐20 launching on an Atlas V, with SNC currently working through 19 milestones via its $80m CCDev-2 effort – the latter of which is listed as the Free Flight Test, which will be a piloted Flight test from carrier aircraft to characterize handling qualities and approach and landing. Milestones, which are listed alongside a schedule document – include a Systems Requirements Review (SRR), Canted Airfoil Fin Selection, and work on their Cockpit Based Flight Simulator – all completed in June and July. SNC officially announced the confirmation of the Cockpit Based Flight Simulator milestone – albeit only this month – a milestone which assists Dream Chaser engineers in evaluating the vehicle’s characteristics during the piloted phases of flight. Also noted was the activation of the Dream Chaser Program’s Vehicle Avionics Integration Laboratory (VAIL), completed in September. VAIL is a platform for Dream Chaser avionics development, engineering testing, and integration, and will also be used for verification and validation of avionics and software. 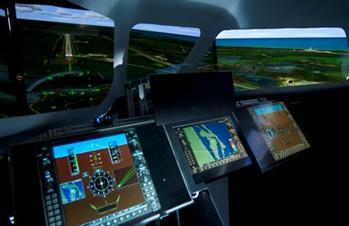 The lab is linked to the Cockpit Based Simulator hardware and software for integrated system testing. “The Dream Chaser team, which includes SNC as well as our industry teammates and our NASA partners, has made tremendous progress over the last four months,” noted Jim Voss, Vice President of SNC’s Space Exploration Systems. “Our simulator and avionics lab give us the ability to do engineering evaluations of our complex systems. Other listed notables include the delivery of the Engineering Test Article (ETA) in December, prior to the Preliminary Design Review (PDR) – scheduled for the end of May, 2012.